The nestlings who each weighed a mere 35-40 grams when they hatched (about as much as 7-8 U.S. nickels) are well fed and growing quickly. At 19 days old we can see flight feathers emerging from their sheaths along the edges of the wings and the tail. The chicks have become much more mobile, and over the weekend clambered out of the nest box. Although they don’t appear able to hop back in yet there is a variety of cover available along the ledge. 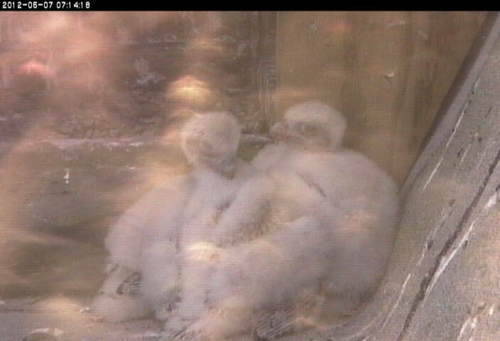 Soon the chicks will be able to stand for extended periods of time and we will likely see their explorations of the ledge expand.